I haven't read something that truly werided me out in a long time. Last night, reading this story really made my skin crawl. This incident was all over the news when we first moved here. I remember thinking it was a little bit odd, but never expected it to be quite this odd. I hope the guys that made the Toynbee Tiles documentary get hold of this and make another investigative documentary. Be sure to watch the video too and scratch your head as to what she is doing with her hands. It helps add to the eerie factor having the jittery low frame rate, "The Ring" style. 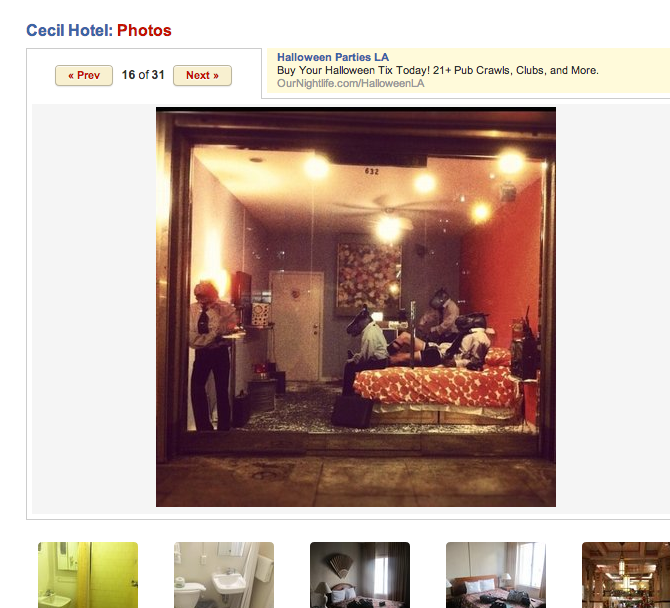 I suppose I need to jot over to downtown and get a look at the Cecil Hotel. I just found this odd Yelp photo of 4 horse (?) hippo (?) men having a party in one of the hotel rooms.